I didn’t used to be disabled. To most people, I don’t even look disabled. I get funny looks when I step out of my car after parking in a marked space. Of course, then they see my service dog and start making assumptions. I have even had people say very loudly “How does a blind person get a driver’s license?” The facepalm moments I experience everyday make my head hurt. But what’s worse is when people start to play the “Disability Olympics” with me. It’s this ongoing contest to determine who has the most disabilities or is the “sickest” amongst a group of people. Like there is some kind of Gold medal for winning at being sick. Some people in the disability community take these Olympics very seriously, becoming upset if someone tries to out-compete them. Sometimes even complete strangers will try to engage me in stores, assuming that since I have a service dog I will be willing to play the game. Having a disability does make me more empathetic towards people in general. I am more likely to share a smile or chat with someone who seems lonely. My service dog opens people’s eyes to the possibility that they too are fragile, subject to the whims of life. It does not, however, make me a disability. I am still a person. I have feelings, hopes and dreams. Aside from my frailties, I’m just like every other person on this rock we call home. So why do I find myself getting angry when someone pulls out the “disability card?” First, you need to understand what I mean by pulling this card. It’s like when there’s a flu bug going around the office and everyone is comparing how long they were out and how awful they felt. Then someone else comes back and loudly pronounces that they had the flu “worse” than anyone else. When it comes to disabilities, that card is supposed to show everyone that the person pulling it is the MOST disabled person in the room. I believe everyone has strengths and everyone has disabilities. We are all capable of great things, regardless of the hand that life has dealt us. Some parts of my life are incredibly easy. Others are incredibly difficult. The only thing I compare myself to is my own ability to do something. Yes, that sounds so clichéd but it’s the way I roll. For the most part, I have nothing to prove other than I am competent at the tasks I undertake. Whether someone does something “better” than me is irrelevant. Their life is different from mine and as such, they can bring different experiences to whatever project is on the table. It’s not a competition. The next time you are comparing yourself to someone else, ask yourself why. Why is it important to have that person’s approval? Why do you “NEED” to be right? Is it worth the emotional energy? Chances are, it’s not. This entry was posted in Life Happens and tagged Disability, Service dog by oystersandlife. Bookmark the permalink. I, too, feel no desire to play the disability card. My disability (hearing loss) is totally invisible, and I do have a service dog to assist with it after having been hit by backing SUVs twice (they didn’t look, I didn’t hear). Honestly, I think some of my non-disabled friends are worse off than I am – I have one who has food allergies, and another gets migraines, and another is always catching the flu or a cold. They are always sick and unable to do fun things. I just can’t hear well, but I’m never sick and I always get to do lots of fun things, especially with a service dog to help me out. 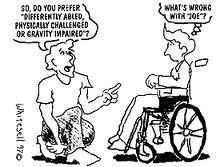 We’re different, and we have different abilities, likes, interests. We don’t pull out the love card, or the like card, or the skills card, do we? Why do people pull out the sick card and the disability card? Noddy- I feel much the same way. Every person has disabilities and every person has abilities. I believe the difference is that people with a known disability have a choice on how they adapt and view themselves whereas people who just get “sick” have a sudden change and don’t always know how to cope with that change.